By default the key source is the channel input. You can use this control to select other channel inputs as the key source. 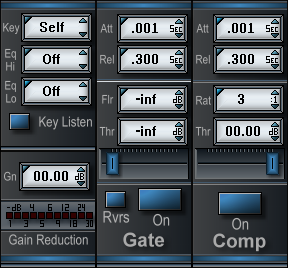 The self channel source is either pre/post EQ depending on the setting in the mixer menu. The alternate channel source is pre-EQ from the alternate channel input section. A simple high-cut/low-cut filter set available for focusing the key signal where you want it. Both filters are sweepable between 40Hz and 15Khz. Sends the key data post filtering to the solo buss. Standard makeup gain control. Variable between -inf and +20db. Sets the time after a signal level rises above the threshold before the gate opens. Sets the time after a signal level drops below the threshold over which the gate closes. Sets a maximum attenuation level for the gated signal. Specifies the signal level required to trigger the gate open or closed. Reverses the function of the gate, causing it to open when the signal is below the threshold and close when the signal is above the threshold. Enables/Disables the function of the gate. Sets the time after a signal level rises above the threshold before the compressor acts on the signal. Sets the time after a signal level drops below the threshold over which compression returns the signal to normal. Sets the ratio by which signals above the threshold are compressed. Specifies the signal level required to trigger the compressor.